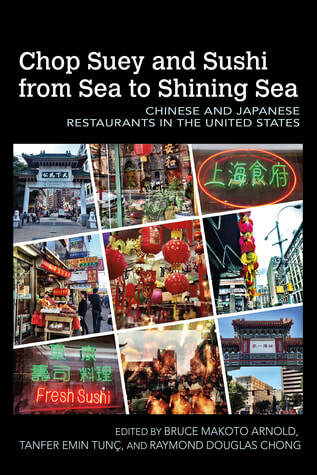 Chop Suey and Sushi from Sea to Shining Sea: Chinese and Japanese Restaurants in the United States. Edited by Bruce Makoto Arnold, Tanfer Emin Tunc, and Raymond Douglas Chong. Fayetteville, AR: University of Arkansas Press. The history of restaurants in the United States is as rich and varied as the ethnicities that populate the nation. Beginning in the late nineteenth century, restaurants began to transform from an institution for only the rich or only for special occasions into institutions embodying the middle-class aspirations of consumer choice and variety. When combined with America’s growing multiculturalism in the mid-twentieth century, these consumerist aspirations gave rise to a sense of cosmopolitanism that translated into the widespread and continued growth of restaurants serving both homegrown and foreign cuisines. Restaurants have become woven into the very fabric American culture: there are almost one million restaurants in the United States—one restaurant for every 314 people residing within the country—and almost sixty percent of Americans dine at a restaurant at least once a week. Over thirteen million people are employed by the restaurant industry annually and almost half of all Americans will have worked in a restaurant in their lifetimes. Restaurants are an inseparable aspect of American history and culture, and eateries impact the lives of each and every person residing on American soil. Initially, Asian immigrant—especially Chinese—employment was circumscribed by American society due to racial prejudice. Individuals of Asian descent were only permitted to work in the service sector, mainly in restaurants and laundries, so out of necessity, they pursued these occupations. Over time, they created a niche for themselves in the provision of such services, and even after employment restrictions were lifted, they continued to work in these areas, passing businesses along from generation to generation and welcoming new immigrants into the fold. Although Asian restaurants in the US have a racially troubled origin, for many, these restaurants have become a pathway to the American dream—a conduit to prosperity and success--which is fueled by consumer demand. This is one explanation for the prevalence of Asian cuisine restaurants in the United States today. Clearly, Asian cuisine has made an indelible culinary imprint on the US, with Asian restaurants playing a significant role in American culture in general..
Critical Perspectives of Black Education: Spirituality, Religion, and Social Justice. I am a co-editor of this anthology. Purchase directly here. While nation engages in debates concerning central issues of religion and religious diversity in education, the historic saliency of religion and spirituality in the Black community and in the education of its children continues to be largely ignored. Historically, religion and spirituality were foundational to the development and understanding of social justice issues, including, but not limited to, issues of protest, community up-lift, notions of care, and anti-oppression. Taking into account the historical significance of religion and spirituality in the Black community, it is essential for education scholars to cultivate these long-standing connections as a means for advancing contemporary struggles for social justice, religiosity in education, and counter-hegemonic praxis. The purpose of this book is to expand our understanding of spirituality and religion as related to the p-20 schooling of Blacks students. Educational scholarship continues to explore the workings of social justice to ameliorate inequities for those who have not been well served in schools. Although the concept of social justice remains a somewhat inchoate term in educational literature, this book seeks to explore the historicity of religion and spirituality while offering a scaffold that links ordinary everyday acts of justice, religion, and spirituality in education to a culture that systematically and institutionally assaults the worth of Black students. It is important to note that this book is grounded in a broad concept of religion and spirituality and the editors seek to be inclusive of all types, styles, and traditions of religiosity and spirituality.